To assist a substantial expansion and immediate relocation, an international Oil and Gas Company required the supply and install of a complete compressed air system on a very tight deadline. As a leading supplier of technology and information solutions to the oil and gas industry worldwide, their expanding workload meant that moving production to a larger premises was imminent. The two warehouses, with a combined space of just under 10,000m2, required a sufficient and cost-effective compressed air solution for Subsea testing, fabrication and pressure testing. Our Compressed Air Representative, Dillon Smith, provided recommendations and alterations to their proposed idea while adhering to their requirements. Adjusting their original plan for three legs off one airline, Dillon recommended the use of a complete ring main system so as to maintain consistent air flow throughout the entire facility. Each drop leg incorporated the Infinity safety couplings, which protects the user from sudden bursts of compressed air when removing tools. Dillon project managed the application from start to finish, which ensured the timely completion and end result the company needed. If you would like more information or advice regarding your application, we welcome you to call us on 1300 290 638, or contact us here! NPS were approached by a major Oil & Gas company to provide a compressed air solution to the South Korean Wheatstone Project. This industrial conglomerate required large scale compressors and dryers on a tight deadline; which we were able to supply them within 2 weeks from the date of order. The new compressors, dryers and accessories needed to be documented and NATA certified, in which our Business Development Manager, Dillon Smith, coordinated from start to finish. For the scope of work they will be undertaking, we supplied two CSB 25 IVR Compressors, two CDX 52 Dryers, plus the appropriate filtration and fittings. In terms of installation, two of their engineers met with Dillon at a conference to seek advice and suggestions for how this should be carried out. This project is unique to NPS, in that we have not commonly supplied to companies of this calibre in this industry; however we have successfully supplied and managed their compressed air needs with confidence. If you would like more information about our compressed air solutions, contact our team here! Laminar flow is an integral component of compressed air efficiency. Believe it or not, laminar flow is controlled solely by the airline used in a compressed air system. To fully understand the effects of laminar flow in a compressed air system, we need to explain exactly what it is. Fluids & gases are unique in their ability to travel. Unlike solid molecules that remain stationary whose molecules tend to join others of the same kind, fluid molecules aren’t so picky. Fluid molecules, such as gases and liquids, partner with different molecules and are difficult to stop. Laminar flow describes the ease with which these fluids travel; good laminar flow describes fluid traveling as straight as possible. On the contrary, when fluid is not traveling straight, the result is turbulence, or a reduction in laminar flow. 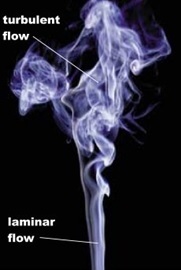 This is depicted in the image on the right; as the smoke comes off the candle, it is smooth and straight (this would be considered perfect laminar flow). As it travels away, the molecules display imperfect laminar flow. Turbulent air flow essentially results in an inefficient compressed air system. This may not seem like a major concern; however, it has huge impacts on compressor efficiency. Fluid molecules bounce and circle within their path, causing huge energy wastage. In compressed air systems, this turbulent airflow results in pressure drop. How do you avoid this from happening? It all comes down to compressed air system design. The design and material of the air pipe, as well as the positioning of elbows and joints, has a direct correlation to laminar flow and pressure drop. To avoid high energy consumption of your compressed air system, reducing pressure drop is key. If your system is experiencing high pressure drop, your compressor has to work overtime to provide the required air pressure. When your compressor works overtime, it not only increases your maintenance costs, but also your energy bills. Laminar flow works in conjunction with the “boundary layer”; this is the very first layer of compressed air that touches the wall of the pipe. Through the use of Infinity fittings, such as the Infinity Reducing tee, the air can travel down the dropper with ease, creating a smooth transition without disruption to the laminar flow. NPS can perform post installation tests on your compressed air system, such as air audits and compressed air efficiency reports. For more information or to speak with our experienced technicians, call us on 1300 290 638 or click here! Compressed air can be extremely dangerous if not used in a safe manner. Even air at a pressure of 15 psi can cause serious injury. Never use a compressed air hose to clean dirt or dust from your clothing or body. Always use goggles or a face shield over approved safety glasses for this application. Exposure to excessive noise can damage hearing. Noise reducing mufflers can be fitted to machines to lessen the noise health hazard. Shut off valves and bleed down pressure before making any hose connections. Use only the correct type and size of hose end fittings and connectors. Always store hoses properly and away from direct sunlight. A hose failure can cause serious injury. Hose reels can decrease your chances of injury, as well as help hoses last longer. A free end can whip and can cause injury. Open the supply valve carefully and ensure that any ejected particles are restrained. A blocked hose can become a dangerous “air gun”. Keeping up to date with your compressor’s servicing schedule ensures air quality is controlled, and reduces the risk of over pressure, and component failure. Only do so if the system has been specifically designed for such purpose, and suitable breathing air filters and regulators are in place. This ensures that air pressure cannot be applied accidentally while the machine is being worked on. Would you like more information on compressed air safety? Contact our friendly team here! Our third year in our biggest stand ever, made this year’s Australasian Oil & Gas exhibition both exciting and successful! Presenting at a larger stand than ever before, NPS had had more room compared to previous displays at the show. As a result, for the first time the stand incorporated a live demonstration of a complete compressed air system, demonstrating how the NPS range is a complete solution. The components of this system included a CSA10 Ceccato compressor attached to a Hydratron hydraulic DHDA118X Pump. Linking these was our innovative aluminium Infinity Pipe, alongside cutaways of the Hydratron DHDA158 and AZ-2 Series power packs. Amidst our live operating system, we were excited to officially introduce Hydratron’s Well Head Control Panel into our product range! A WHCP is a Hydraulic power unit with some specific features such as emergency shutdown. If you would like more information about our products or involvement in AOG, contact our friendly team here!